Intraday trading is not like a long-term technique that requires the patience of traders to wait for certainty of trading results. The position is opened and closed on the same day, so traders can get profit on that day. Even if you get a loss, the loss experienced will not drag on. Such techniques are easier to help traders to quickly move on and focus on finding new opportunities the next day. Perhaps, that is what makes intraday trading favored by many traders. 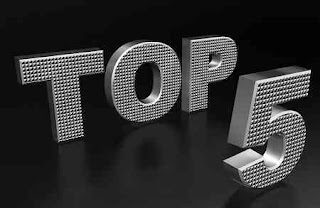 However, there are so many forex strategies that can be applied, so often make traders confused to determine the mainstay forex strategy. Suitable for use in the H1 and H4 time frames, here are 5 choices of strategies for intraday trading that you can try. Following trends is often plotted as a forex strategy the easiest mainstay in intraday trading. Basically, you can simply identify the price trend on the chart and act to follow it. 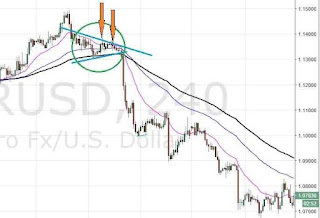 The trend following strategy that we discussed here is Roman Sadowski's recommendation from HumbleTraders, and only uses a combination of Exponential Moving Average (EMA) lines. Buy signals appear when 20 EMA cuts EMA 60 from bottom to top. If the 20 EMA cuts the 60 EMA from top to bottom, then it can be interpreted as a sell signal. On the other hand, EMA 100 can be relied upon as an accurate trend marker. If the indicator line moves convincingly above the price, then the market is being dominated by a bearish trend. Whereas if the 100 EMA moves below the price, then the bullish trend is more dominant. 100 EMA that cuts prices from the bottom up indicates a trend change from bullish to bearish, and vice versa if the EMA 100 crosses the price from top to bottom. In a 100 EMA scenario that moves close or even close to the price, it indicates market uncertainty. 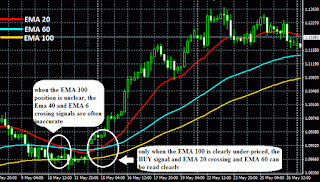 EMA 20 and EMA 60 crosses in such conditions should be carefully watched. Don't rush to follow up on the crossing signal before the 100 EMA shows a clear change in trend direction. The price response to the release of a big impact news is indeed quite significant, so that it can present a considerable opportunity for intraday trading. In this case, it is very important for you to understand the trading rules based on the news. Following the news release schedule on the forex calendar, and drawing red thread from consensus figures, previous, and actual data is the ability that must be mastered by a news trader. Entry considerations are strongly recommended to wait until the news has really rolled and the initial effects subside. You can wait about 15 to 30 minutes after the news release, then plan the entry position with price action. A simple NFP trading strategy from Cory Mitchell for example, encourages traders to wait 15 minutes before looking for a benchmark entry from the inside bar. The basic idea of ​​scalping that is looking for profit from the smallest price movements is actually in line with the principle of applying intraday trading. 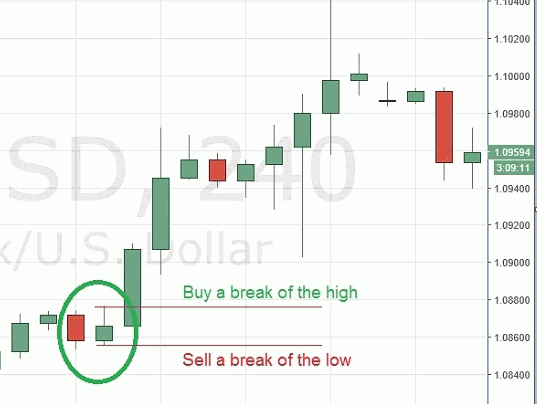 With a low time frame reference and minimal but frequent profit targets, scalping can inevitably be a mainstay forex strategy, if you want to collect several times the profit in a day. There are a variety of scalping techniques that can be used, including simple strategies with 3 easy steps: determining the direction of the trend, looking for momentum, and finding exit levels according to risk management. The strategy that uses the MA and CCI indicators can be seen in full in the article: Simple Strategies for Scalping. This mainstay forex strategy focuses on the ease of trading in sideways markets, precisely when price movements tend to adhere to the limits of support and resistance. If you have found that support resistance, then planning the entry and exit positions is not too difficult. It's just that, getting the ideal support and resistance limits can cause its own difficulties, considering the determination is often subjective. You can observe high-low prices yourself, apply Fibonacci, or rely on pivot points. In the daily trading session, the best time to run the trading range is in the Asian session. At this time, market liquidity was relatively low and there was minimal price upheaval. Despite the release of economic data from Japan, Australia and New Zealand, the impact is usually not as strong as the news effects in the European and American sessions. There is another alternative trading range that does not take advantage of resistance support and certain sessions. 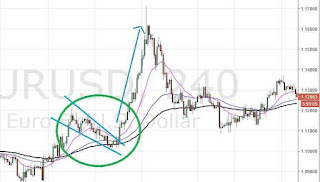 This idea again came from Roman Sadowski who preferred to use candlestick patterns to set ranges. According to him, the candle formation with a small axis can be used as a reference, because it indicates the density between open-close and high-low prices. In this case, the next break candle from level high or low candle can trigger the entry signal. Who says that price swing changes can only be used in swing trading that is suitable for medium to long-term trading? In fact, this one-sided forex strategy proves that swing trading also has a special version to be used in intraday trading. 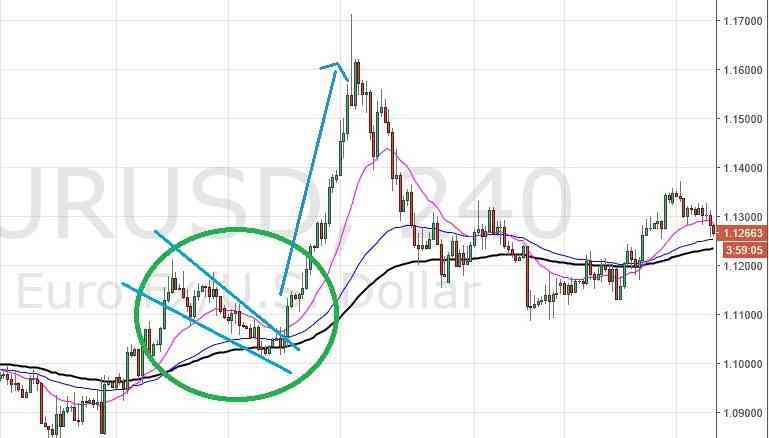 The price pattern theory plays an important role in this flagship forex strategy, because the price swing signal is first identified from the price pattern formed on the chart. The H4 chart below shows an example of EMA crossing combination with a price pattern analysis to detect changes in price direction. The price pattern that is formed on the chart above is a triangle, or also known as the marker pattern of breakout. The direction of the breakout is then confirmed by the EMA cross which indicates a sell signal. The reflection of the chart above shows that this strategy does not always depend on indicator signals. Although there are no signals from the EMA lines, changes in the price direction can be predicted with a falling wedge appearance, a consolidation pattern that is usually followed by a bullish reversal. This condition makes this strategy more responsive than the trend following who must wait for the EMA crossing signal first. One of the disadvantages of this method is the identification of price patterns that require visible observation, because there is no default MetaTrader indicator that can show parice patterns. However, you can search for additional tools from other sources, such as the Autochartist which is specifically made to recognize price patterns on the chart. Always test the mainstay forex strategy that you will use. Perform a backtest and forward test on a demo account to find out the probability of a strategy. The rules in the strategy must be carried out with discipline. Intraday trading requires more focus and concentration, because capturing trading opportunities at a low time frame means that it must be responsive to rapid price changes. If you are not disciplined in carrying out a strategy, then the influence of emotions will easily dominate trading decision making. If not careful, something like that can lead to overtrading. Don't forget to apply money management. Whether setting size per trade or using a risk / reward ratio, money management should not be abandoned. Remember, limiting risk is no less important than getting profit. It's useless to be able to get profits every day if your total loss is not as big as the amount of profit earned?